The latest NeuroTracker study has revealed that your ability to track multiple targets in 3D is probably akin to your level of fluid intelligence. The findings provide a fresh perspective on the relevance of this type of cognitive training to human performance. We’re all familiar with the notion of IQ. What we are less familiar with is that IQ is broken into two separate domains of intelligence: crystallized and fluid. Crystallized is basically about our ability to store and remember knowledge (think of Jeopardy champions), whereas fluid intelligence is more about our capacity to process, analyze and evaluate information in the moment. In a nutshell, it’s about memory versus thinking. Knowledge is pretty much straight-forward to assess, and so people’s abilities on this side tend to be fairly well understood. On the other hand, fluid intelligence is somewhat more ephemeral, as it depends very much on the type of information and circumstances in terms of judging how well someone can think about them. Imagine trying to compare a quarter back playing in the NFL to a surgeon at the operating table. This is why IQ tests try to test very abstract and generic thinking processes like logic puzzles. 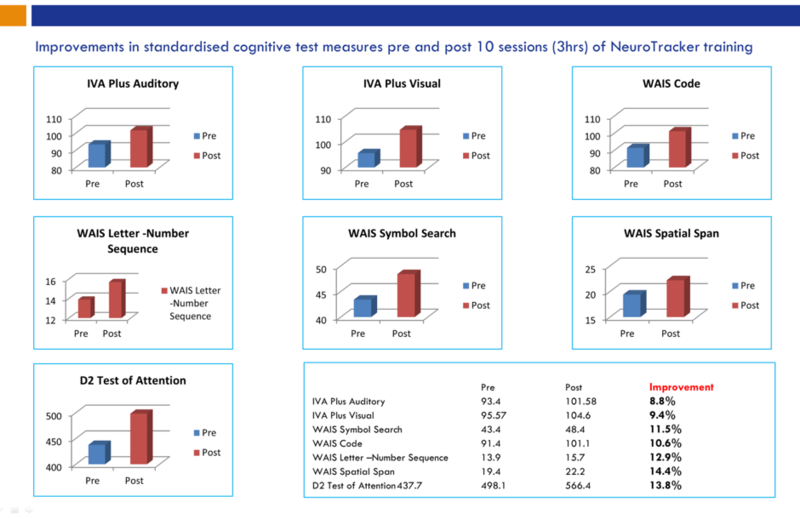 70 young adults were assessed on NeuroTracker and the Weschler Abbreviated Scale of Intelligence 2 test. Significant correlations were found between the two sets of results. This is, if NeuroTracker scores were higher than average, fluid intelligence was also higher, and vice versa. The participants were tested on 1, 2, 3 and 4 target tracking on NeuroTracker, and the data showed that correlation withthe level of fluid intelligence was highest at 4 targets. This suggest that the abilities involved with distributing mental focus, across several streams of attention simultaneously, is a key factor in thinking skills. Fluid intelligence is known to be important in most domains of human intellectual performance. Tracking balls bounce around a screen is a pretty abstract task, ipso facto, this is something most people would not normally associate with thinking skills. However, as we covered in a recent blog on the fundamentals of NeuroTracker, there are a special set of characteristics packaged into this training methodology that pack a cognitive punch when combined. For this reason NeuroTracker has top-down effects on cognitive function, even being shown to directly engage the command centres of the brain involved with complex decision-making. NeuroTracker inventor and researcher of the study, Professor Faubert, chose to investigate this relationship between a visual processing task and fluid intelligence because of the many studies showing that NeuroTracker engages a slew of important brain functions. In addition, scores on NeuroTracker have been shown to differentiate experts from amateurs in sports, as well as different populations and cognitive conditions. “Unfortunately, the traditional approach for fostering young minds in the classroom still tends to revolve around increasing crystallized intelligence (knowledge-based abilities), as opposed to fluid intelligence (thinking, reasoning and problem-solving abilities). Focusing on crystallized intelligence, rather than fluid intelligence, could be because it’s simpler for institutions to do so. Accordingly Matthews supports cognitive interventions like NeuroTracker, as these methods can boost core learning capacities, with the goal of improving long term educational and career outcomes. For this reason he is currently launching international trials with leading education institutes in order to track the impact of cognitive training on academic performance. Supporting this, peer reviewed research has shown that even short NeuroTracker interventions with college students boost a wide range of high-level cognitive functions, as measured on industry standardized neuropsychological tests. This also correlated with positive increases in brainwave activity measured via qEEG assessments, across their brains. Perhaps more promising is the pioneering research from the Perceptual Neuroscience Laboratory for Autism and Development. This controlled study showed that a 3 hour NeuroTracker intervention significantly enhanced the attention capacities of children with learning disorders. These included conditions such as Autism Disorder, ADHD and Intellectual Deficit. The evidence that fluid intelligence and NeuroTracker are closely related goes some way to explaining why this form of cognitive intervention can be so effective, and why such top-down effects occur with training. You can read the summary of the study by downloading our free ‘NeuroTracker Science Overview’ here (study no. 33). To find out more about NeuroTracker and educational learning, check out these blogs.